From the press release from the American Library Association: “The American Library Association (ALA) today announced the top books, video and audio books for children and young adults including the Caldecott, Coretta Scott King, Newbery and Printz awards at its Midwinter Meeting in Philadelphia.” Here is a partial list of all the 2014 award winners, with more awards posted tomorrow. 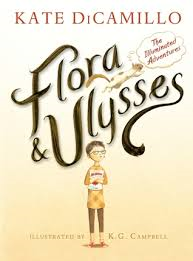 Flora & Ulysses: The Illuminated Adventures, written by Kate DiCamillo, is the 2014 Newbery Medal winner. The book is published by Candlewick Press. Four Newbery Honor Books also were named: Doll Bones, written by Holly Black and published by Margaret K. McElderry Books, an imprint of Simon & Schuster Children’s Publishing Division; The Year of Billy Miller,written by Kevin Henkes and published by Greenwillow Books, an imprint of HarperCollins Publishers; One Came Home, written by Amy Timberlake and published by Alfred A. Knopf, an imprint of Random House Children’s Books, a division of Random House, Inc.; and Paperboy, written by Vince Vawter and published by Delacorte Press, an imprint of Random House Children’s Books, a division of Random House, Inc.
Locomotive, illustrated by Brian Floca, is the 2014 Caldecott Medal winner. The book was written by Brian Floca and published by Atheneum Books for Young Readers, an imprint of Simon & Schuster Children’s Publishing. Three Caldecott Honor Books also were named: Journey,written and illustrated by Aaron Becker and published by Candlewick Press; Flora and the Flamingo,written and illustrated by Molly Idle and published by Chronicle Books LLC; and Mr. Wuffles! written and illustrated by David Wiesner and published by Clarion Books, an imprint of Houghton Mifflin Harcourt Publishing Company. P.S. Be Eleven,written by Rita Williams-Garcia, is the King Author Book winner. The book is published by Amistad, an imprint of HarperCollins Publishers. Three King Author Honor Books were selected: March: Book One, written by John Lewis and Andrew Aydin, illustrated by Nate Powell, and published by Top Shelf Productions; Darius & Twig,written by Walter Dean Myers and published by Amistad, an imprint of HarperCollins Publishers; and Words with Wings, written by Nikki Grimes and published by WordSong, an imprint of Highlights. Knock Knock: My Dad’s Dream for Me, illustrated by Bryan Collier, is the King Illustrator Book winner. The book was written by Daniel Beaty and published by Little, Brown and Company, Hachette Book Group. One King Illustrator Honor Book was selected: Nelson Mandela, illustrated and written by Kadir Nelson and published by Katherine Tegen Books, an imprint of HarperCollins Publishers. When the Beat Was Born: DJ Kool Herc and the Creation of Hip Hop, illustrated by Theodore Taylor III, is the Steptoe winner. The book is published by Roaring Brook Press, a division of Holtzbrinck Publishing Holdings Limited Partnership. Authors Patricia and Researcher Fredrick McKissack are the winners of the Coretta Scott King  Virginia Hamilton Award for Lifetime Achievement. The award is presented in even years to an African American author, illustrator or author/illustrator for a body of his or her published books for children and/or young adults, and who has made a significant and lasting literary contribution.